The timber is Swamp Gum (Eucalyptus ovata) a gum that grows in wetlands area of Australia and is also called called River Gum. I manage to get a couple of sticks from fellow woodworker Jock Sloan. We effectively did a swap so I dont have a dollar value of it. I have had the timber since 2014 and made quite a few projects over the 3 years. This piece was the last of it. 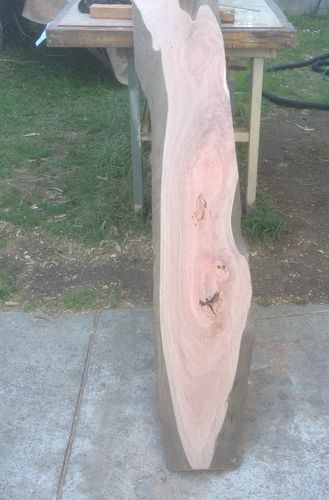 A next door neighbour asked me if I was interested in making a sink cutting board for their caravan. The dimensions are over 400mm and I had no single pieces of timber with that dimension that I could use. They also asked that it have an opening to enable waste to be dropped into the sink and a means to pick it up and remove it as well. 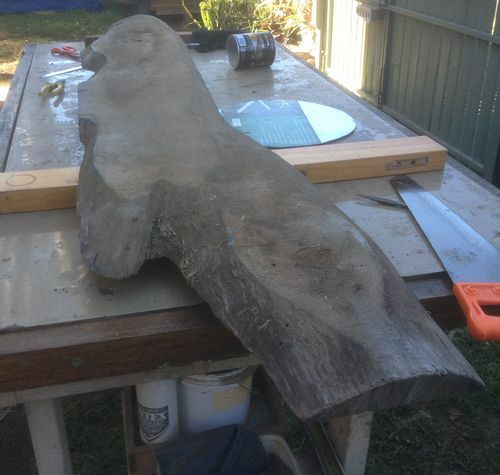 So after looking through my stock I spotted the piece of Swamp Gum, and even it was not wide enough. Any way I pulled it out and took a look at it, I found it was surprisingly flat with only a slight twist it. I had to cut about 50mm off the edge to enable it to fit into my thicknesser. Then with a lot of huffing and puffing I fed it through the machine. I milled it down to 28mm but it was still too narrow to use as one piece, due to a few manky defect encountered. so I looked at cutting two sections from it and join them together. 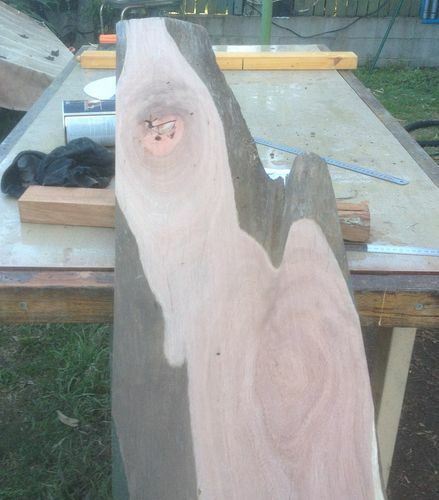 I used a sabre saw to rough cut the two pieces then the band saw to get a reasonable profile. They were now managable enough to joint the two edges and fit biscuits then glue them back together again. I used a pair of parallel clamps to do this. 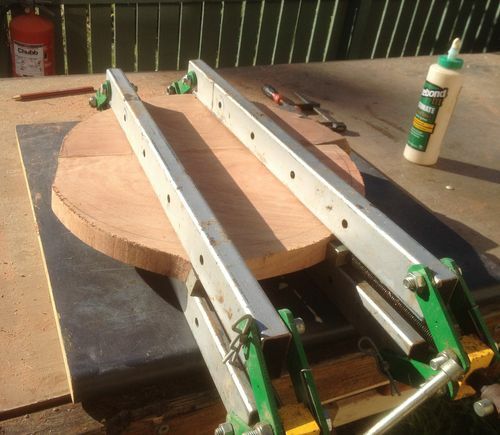 Once the glue was set I then drew a circle on the piece to get the required diameter. Then it was back onto the bandsaw for some more accurate cutting. 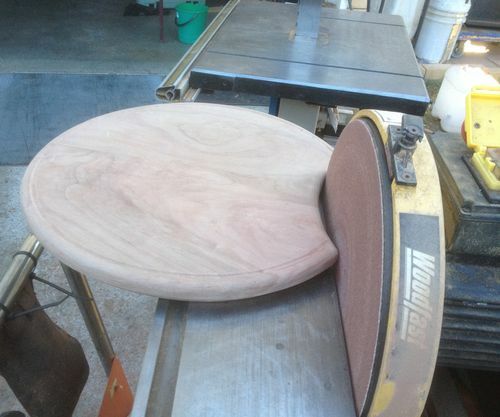 Next was the disk sander to smooth the edges to the pencil line, and Oscillating sander on the concave section. I didnt take a picture at this stage so I just sat the profiled board there for an example picture only. There was a few visits back and forth to get the board to fit perfectly in the sink removing small amounts at a time as I didnt want it moving about on the sink when in use. Once this was done I routed the edges and juice groove to complete the build work. The usual sanding then went on and once that was finished a coat of oil applied. It was ready for delivery. Very nice Rob. That looks really good. nice use of that slab rob,beautiful wood im sure there gonna love that cutting board. The only thing missing is a photo of the finished piece in the sink it was intended for. Nice job, and a beautiful piece. This is a nice board and the wood is beautiful. Beautiful wood and cutting board crafted from it, Rob! Should bring a smile every time it is used! I have to hand it over today so I will thake a picture of it in the sink and add them. Its interesting I also wondered if I should add a in use picture when I prepared the post, incidently it looks like another is on the drawing board as my son spotted it and wants one for their camper too. Rob, what a fun and useful project. 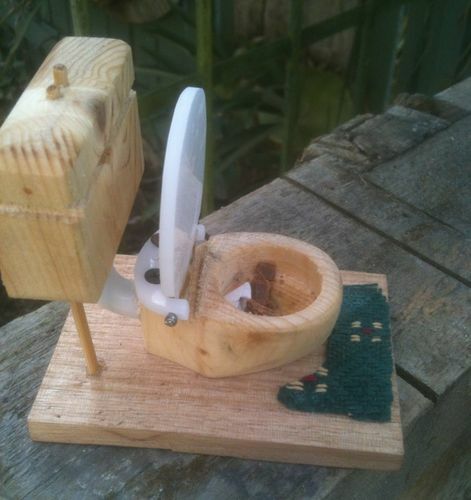 Looks like your next project should be a toilet seat…well maybe not. This wood is really beautiful. I like the clamps you used…those are brutes. Thanks, as always, for taking us along on this project. 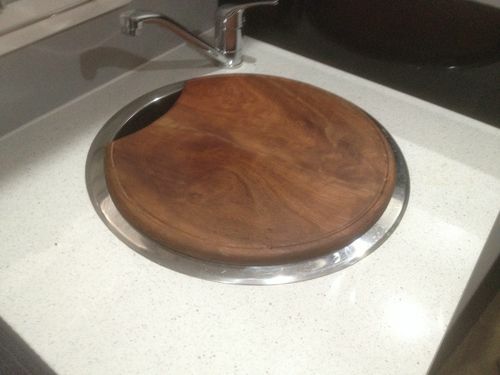 Ha ha Al… yeah it does look a bit like a Dunny lid now you metion it. A project from some time ago….. The clamps were a PU from Degoose. Here it is finished and in Location. They were very happy and asked me to do some more work. I wondered why you had that cove CUT out of the top like that! Nicely done and I love that wood grain! Beautiful! There’s nothing more satisfying than beauty and function combined.